I didn't know that the 27-year-old, quasi food TV personality and wife of Billy Joel, Katie Lee Joel, had a book... but she evidently does. 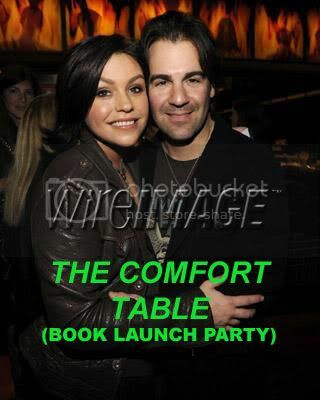 The launch party for her cookbook, The Comfort Table, was held recently in New York and some of Food Network's finest showed up. Oh, and John Cusimano Ray was there, too. It's probably bad to say, but I'm hoping Food Network does not have Ms. Joel in its sights as a possible Food Network star. After watching her judge last year's All Star Holiday Iron Chef battle and seeing her in-person in Miami, I'm just not all that taken by her. In fact, I'm kind of creeped out by her overall demeanor. Still, there are several celebrity endorsements on her Amazon page from the likes of Giada De Laurentiis, Oprah's Nate Berkus, and Paula Deen even wrote the book's foreword. So maybe I'm just freaking my freak. 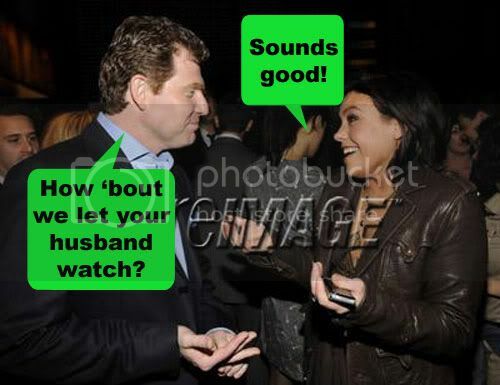 In more interesting Food Network Addict photo captions, it looks like Bobby Flay was up to his old tricks again when speaking with fellow Food Networker, Rachael Ray. Uh huh! Now look what he's doing! Hahaha... Bobby, you sly dawg. You better watch out or that real wife of yours will pack up. Mrs. Joel also hosted the first season of Top Chef, and I believe is friends with Giada because she appeared on an Episode of Weekend Getaways or whatever Giada's travel show was called. Katie Lee can only be described as robotic. Anyone who thinks Padma's bad on Top Chef obviously hasn't seen how disasterous Joel was. I've seen rocks with more personality than Katie Lee Joel. She almost killed Top Chef for me. I really like Padma. "Oh, and John Cusimano Ray was there, too." Classic. Pretty funny.Imagine waking up in the morning and seeing "that" laying beside you. It's like a homeless man jumped into my bed and he says he is my husband. Katie Lee Joel? Golddigger supreme ? "How ' bout we let your husband watch" ? I think Katie Lee guested on Paula's Party, and mentioned, IIRC, she was writing a cookbook. oh my god, the caption on the last photo killed me.